It is yet to be seen whether the Court has 'put our records correct' forever or not' - such was the conclusion of my write up in the Law and Our Rights on February 14, 2009. Then I was reviewing the historic judgment of the High Court Division in the celebrated 5th Amendment Case. With a heart full of content, today I see the august citadel of justice not only put the record correct but also decides to bade the ghost of Dosso [State v. Dosso 11 DLR (SC) 1] a good bye from our jurisprudence forever. I'm speaking of the recent 184 page judgment of the Appellate Division in 5th Amendment Case. It is a mere piece of land and the building standing on it - The Moon Cinema Hall - that has shaken the earth to dislodge the basement of 'palace clique, deception and disappointment' 'the long shadows of the Marshals.' Starting the voyage with the Writ Petition No 67 of 1976, the ship sees the shore in Civil Petition for Leave to Appeal Nos. 1044 & 1045 of 2009. It is not only a piece of land that is restored, rather it is a nation's 'dignity, honour and glory achieved through great sacrifice' that is reestablished (p 181). Such an economic outlook, it is humbly submitted, may serve in lightening the weight of a serious constitutional issue like nationalism. Perhaps condonation of the change in Article 6 might have been based on some thing else. In my constitutional law lectures I respond to my students' query from a different perspective. To me, nationhood is something different from citizenship. A nationality grows out of common descent, common heredity and common environment. To be a nation a people need, apart from geographic unity, a community of language, religion, interest and political aspiration. Our nationhood arises out of the racial origin we belong to. We are the Bangalees having root in our ethnic homogeneity irrespective of our religious diversity. On the other hand, in terms of citizenship - a mere political status - we unfortunately had to bear so many identities. Before 1947 we were the British Indians, thereafter the Pakistanis and now the Bangladeshis. Our political status changed over times. But ethically, linguistically and culturally we remain today what we were thousands years ago Bangalees. Undoubtedly it was the spirit of Bangalee nationalism, our proud sense of being Bangalees and the Pakistani junta's prejudice towards the 'Bangalee Babus' that spearheaded the historic struggle for national liberation in 1971. Bulgakpur (land of rebels) to Bangladesh it was the Bangalee nationalism that lit the light all through the way. To dispel the conspiracy to delete the word Bengal forever from the map of East Pakistan, East Pakistan became 'Bangladesh' on December 5, 1969. 'Except the Bay of Bengal there is no sign of the term 'Bengal' anywhere', Bangabandhu regretted that day. Even in August 25, 1955, in spite of severe opposition from Muslim League and Islamic political parties in the Constituent Assembly, Bangabandhu opposed renaming East Bengal as East Pakistan, 'Sir, you will see that they want to place the words 'East Pakistan' instead of 'East Bengal'. We have demanded so many times that you should make it Bengal (Pakistan). The word 'Bengal' has a history, has a tradition of its own' (Dr. M A Salam v. Bangladesh 18 BLT (Spl) (2010) 1, Para 15). Hence, the original Article 9 read with the original Preamble truly justified Bangalee Nationalism as a corner stone of the nation state Bangladesh. Even then specification of nationalism in the sense of citizenship might have been avoided in 1972. Article 6 may accommodate the Bangladeshi Citizenship without any substantial damage to the Bangalee Nationalism in Article 9. However, it must also be recorded that the dictator substituting Bangladeshi for Bangalee in Article 6 was not so pious as to correct a mere clerical mistake. Rather it was a part of the conscious plot to dislodge the Bangalee nationalism, a structural pillar of the liberation struggle, from the Constitution. Article 9 was substituted with a non significant provision to 'encourage' local government institutions. Robbing Peter to pay Paul! Hence, while reviving the original Article 9 and leaving Article 6 as it is, the Honorable Court, it is submitted, might have put its reasoning a bit differently. Apart from Article 6, the Appellate Division decided to condone the introduction of Supreme Judicial Council in Article 96. Earlier a Judge of the Supreme Court of Bangladesh may be removed from the office by the President on the ground of “misbehavior or incapacity” by a two-thirds majority in the Parliament. 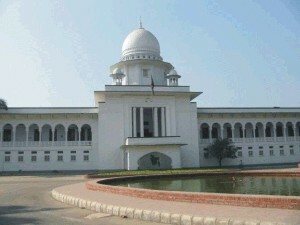 Under the amended procedure a Judge of the Supreme Court of Bangladesh may be removed by the Supreme Judicial Council. The Court found this substituted provision to be 'more transparent' than that of the earlier one and 'safeguarding independence of judiciary' (p 177). It is respectfully submitted that this observation of the Honorable Court may miss the core issue of separation and balance of power. Article 92A empowering the President to dissolve a 'derailed' Parliament was an import from Pakistan. With a rubber stamp parliament in hand, the 'President' needed complete control over the judiciary as well. Hence the concept of Supreme Judicial Council was also copied from Pakistan and pasted in Article 96. Side by side, the provision for consultation with the Chief Justice in appointing the Supreme Court Judges was consciously not revived. Now appointment and removal of Judges both remain in the hands of the executive. Parliament remains to be a mere deliberative forum for 'ratifying, confirming and validating' all the illegalities committed by the illegal President. It is submitted that removal of judges by the Parliament with a two-thirds majority goes more with the doctrines of separation of power and checks and balances. It must not be forgotten that the Parliament requires a two-thirds majority to amend the constitution itself. With a requirement of two-thirds majority for their removal, Judges of the Supreme Court are more valued than they are under the present scheme of Article 96. Moreover, a parliamentary proceeding is at any rate more transparent than an executive one and the independence of judiciary is not less safeguarded under this scheme. It is my humble wish that the apex Court may not have condoned the changes in Article 96. Now-a-days in Bangladesh, a history is in the making. With the Martial Law declared unconstitutional, illegal, mischievous and not founded on any known source of law, the whole nation goes out of a state of siege. No more 'We, the people of Bangladesh,' wish to be taken hostage (p 151). We want to 'see that the Constitution is upheld, it is not kept in suspension, abrogated, it is not subverted, it is not mutilated, and to say the least it is not held in abeyance and it is not amended by any authority not competent to do so' (p 182). 'Let us bid farewell to all kinds of extra constitutional adventure for ever,' the Court invites. Yet the question remains, 'Is the Court the only light at the end of the tunnel?' May the courts change the course of the history? True it remains, as it was, a military coup does not depend on the court's justification or judgment. Rather it conversely controls the courts and judges. Therefore ultimately it is the politics pure and welfare politics that can determine the course of the history. The Court has discharged its historic burden 'so that the history never repeats' (p 155). Are the politicians ready to discharge theirs? The writer is Assistant Professor, Department of Law, Northern University Bangladesh (NUB), Dhaka.